The closest long stay car park to the terminal, just a mile away, and the official BAA on-airport car park. Glasgow Long Stay has 24-hour CCTV and is manned and patrolled 24 hours a day. The car park is fully fenced and has floodlighting at night and an entry barrier. This car park has been awarded the Park Mark, a national security award accredited by the Association of Chief Police Officers. Before being awarded the Park Mark, car parks have to be inspected by the police. They have to have modern security measures, such as alarms and CCTV, and be clean and well-lit. Car parks which have been awarded the Park Mark are regularly reinspected by the police. Special price that isn't always available. There are parking bays for Blue Badge holders near the bus stops. The courtesy coaches are wheelchair accessible. Trailers are not permitted. Supersaver also available. This booking is being made at a special low price that is not always available. Because of this, once you have made the booking it cannot be changed, and if you need to cancel we cannot give you a refund. If you think you may need to change or cancel your booking, we suggest you book the same package with us but at the normal price, which will give you more freedom to change or cancel your booking. When you arrive at the Glasgow airport long stay car park, take a ticket from the barrier and park. Make a note of what zone you are in and the nearest bus stop. Once you've collected your luggage, head out of the terminal and go to bus stop 3 by the international arrivals door. From there, a transfer bus will whisk you back to your car. To exit the car park, show your ticket to the customer service office near the exit and you'll be on your way. You will need to have your booking reference number to hand to exit. From St James Interchange (J29 M8 East), take the exit for Glasgow Airport. Turn into the one-way system, ensuring you move into the right hand lane. At the first set of traffic lights, turn right. Proceed to the next roundabdout and turn left onto St Andrews Drive. Proceed to the next roundabout and turn right onto Sanderling Road. Proceed to the next roundabout and turn left onto Abbotsinch Road. Proceed to the next roundabout and turn right onto Arran Avenue where you will see the car park. 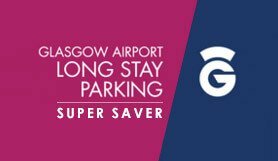 From Glasgow City Centre and the east, take the Glasgow Airport exit (J28 M8 West) ensuring you are in the right hand lane on the slip road. At the roundabout at the bottom of the slip road turn right onto Sanderling Road. Proceed to the next roundabout and go straight across, at the next roundabout turn left onto Abbotsinch Road. Proceed to the next roundabout and turn right onto Arran Avenue where you will see the Car Park.